SteelSeries is one of the few companies that always maintains a firm direction and doesn’t easily succumb to latest trends. Their accessories perform up to the highest standards without being overly flashy. 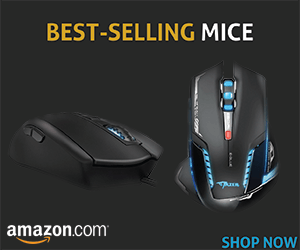 The SteelSeries Rival 300 optical gaming mouse is a prime example of this approach. This relatively simple mouse is designed for right-handed gamers and features ergonomic design without any sharp edges. The raised back makes your hand naturally fall in the claw-grip position, which make feel awkward at first, if you are used to another style of mouse grip, but which becomes a second-nature after just a few hours of gaming. Unfortunately, the finish is a mixed bag. The top and back portion of this mouse is coated with an anti-sweat layer, which works amazingly well. My hands stayed soft, even after many hours with the AC off. The problematic part is the pair of rubber side grips. These feel much cheaper than the rest of the mouse and we were able to sport some initial wear after a very short period of time. It’s hard to imagine what the side grips would look like after a few months spent with this mouse. Another problematic part of this mouse is the cable. It’s coated in relatively grippy plastic material, which makes it stick to the table and cause all sorts of problems. You can, of course, replace it with another one, but users should never have to result to such DIY solutions. The slight construction issues aside, the internals of this mouse are just what you would expect from a renowned company such as SteelSeries. The Avago ADNS 3310 optical sensor offers zero hardware acceleration and true 1:1 tracking. You would be wasting your time looking for any signs of lag – there simply isn’t one. 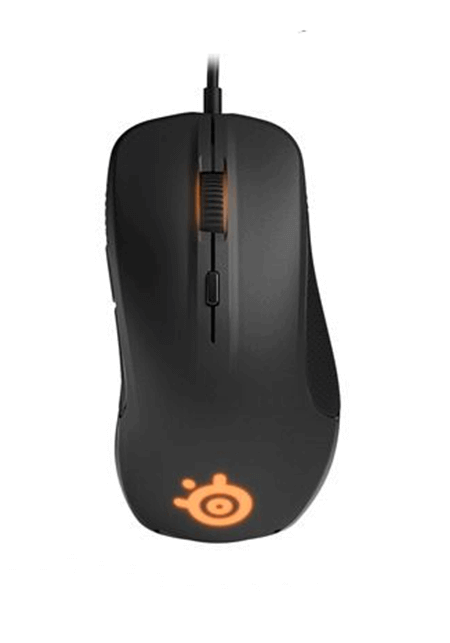 SteelSeries says that the switches used in this mouse have 30 million clicks lifecycle, and we have no reason not to believe them. They feel extremely responsive and their low travel provides with an unprecedented precision. It actually becomes hard to use any other mouse after you get used to them, because of how clunky it begins to feel. The SteelSeries Rival 300 optical gaming mouse is highly customizable with 16.8 million color RGB lighting system adjustable in 2 zones. If colors aren’t enough, there’s even the possibility to use custom 3D-printed nameplates. That’s definitely something that you don’t see every day. 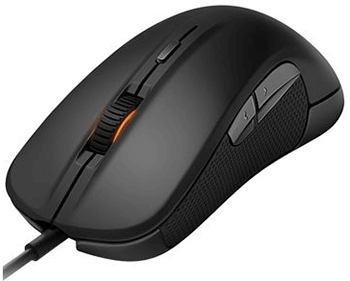 In conclusion, the SteelSeries Rival 300 is recommended for people who prefer simpler mouse shape and a straightforward control scheme that doesn’t require any time before you get used to it.